AN AQUIFER IS a subsurface structure or formation that provides a sufficiently permeable condition to yield significant quantities of water to wells and springs. Soil water movement is determined by two factors: porosity, which is the ability to hold on to water particles, and permeability, which is concerned with movement. The word aquifer comes from two Latin words: aqua, or “water,” and ferre, “to bear or carry.” Aquifers literally carry water underground. Precipitation or meteoric water migrates its way downward through the pores or cracks in the soil. Beneath the soil surface is the zone of aeration in which the smaller openings contain a little water and the larger spaces usually contain air. Often soil particles are thinly covered with hygroscopic water, while capillary water is held close to the surface for plant needs. Excess water will infiltrate by gravity to a point where all the spaces are filled with groundwater, which begins the zone of saturation. The top of this layer is called the water table and it will fluctuate depending upon precipitation or draw down. 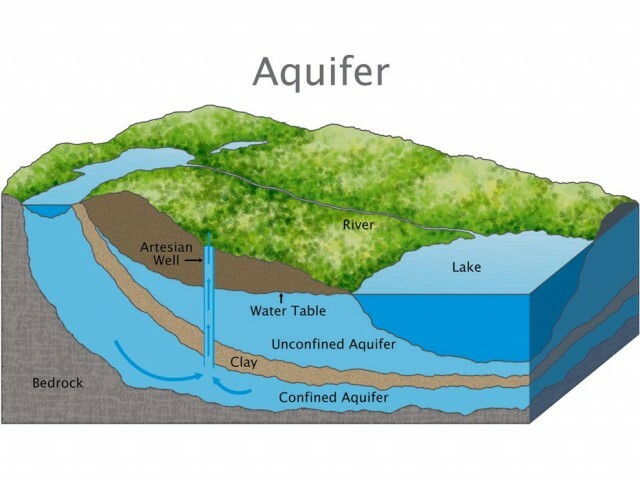 Aquifers are moderately to highly permeable layers of rock in which groundwater is stored or through which it moves. The formation may be a layer of gravel or sand, a layer of sandstone or cavernous limestone, a rubbly top or base of lava flow, or even granite fractured by ancient ice sheets. Some rock, such as clay or solid granite, may have only a few hairline cracks through which water can move, making them poor aquifers. In terms of storage at any one given time, groundwater is the largest single supply of fresh water available for use. It is estimated that it is more than 30 times greater than all the water stored in streams, rivers and freshwater lakes, yet most of it is not easily accessible. The largest aquifer in the UNITED STATES is the Ogallala, which underlies the land from SOUTH DAKOTA to northern TEXAS. Rainwater that migrates downward directly to the water table creates an unconfined aquifer, which may be shallow and therefore susceptible to contamination from industrial landfills, agricultural chemical runoff, sewer leakage, faulty septic tank operation, or even salt-water intrusion in coastal areas. A confined aquifer occurs when water is stored beneath a blocking stratum or aquiclude that stops the direct movement of gravitational water to it, allowing water to migrate over long distances, taking years or even centuries. The quality of groundwater is determined by the depth of the aquifer as bacterial or human pollution can be screened out by the rocks and soil. Water from a confined aquifer will tend to be freer of dangerous materials. a confined aquifer will rise to a level called the piezomatic surface, which is dictated by the pressure. When pressure forces flowing water to the surface, it is called an artesian well. The largest of these formations is Australia’s Great Artesian Basin.